Costa Rica offers a wide variety of attractions and activities. It provides any traveler with a vacation experience unrivaled for its rich biodiversity, easy access to national parks, and an eco-focused tourism infrastructure. Despite its small size Costa Rica is home to an astonishing 3% of the planet’s biodiversity and 3.5% of the world’s marine life. And not surprisingly, Costa Rica is a leader in sustainable tourism practices. With Costa Rica’s pleasant year-round temperatures, there is always something to do outside. Top-tier golf, fishing, world-class scuba diving and birdwatching are all available in different regions of the country. From a zipline ride through the cloud forest, to horseback riding on the beach or a walk through one of dozens of national parks or reserves, life in Costa Rica Rica’s definitely best enjoyed outdoors. 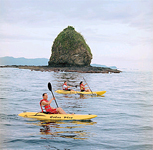 Costa Rica is also home to ideal waters for surfing, whitewater rafting and kayaking. There are few countries where a visitor can enjoy true natural wonders from coast to coast. Costa Rica is comprised of a various microclimates and astonishing natural wonders. Mountain ranges, rainforests, active volcanoes, cloud forests and the beautiful Cocos Island are just a few of the landscapes for which Costa Rica is famous. The Central Valley is a green patchwork of coffee plantations, tropical forests and well-ordered farm dotted with interesting towns. There are many things of interest for visitors just a day-trip away from you hotel, including volcanoes, waterfalls, whitewater rafting, coffee plantation tours, rainforest tours and butterfly farms. San Jose is a congested, bustling capital city with over a million inhabitants in the greater urban area. Places of interest are the National Theater and Gold Museum, both located at the Plaza de la Cultura, and the Jade Museum on top of the INS insurance building. This region of Costa Rica is for nature-loving and active travelers! One can easily spend a week or more in the highlands and plains north of San Jose, especially between visits of the Caribbean and/or Pacific coast. The main attractions of the Northern part of the country are the majestic Volcano Arenal, the Monteverde cloud forest and the Sarapiqui area which wraps around the lower slopes of the Braulio Carillo National Park. This part of Costa Rica, the Northern Pacific coast - aka Guanacaste province - is a year-round favorite destination with a noticeable dryer climate than the rest of the country. And the recently inaugurated international airport of Liberia has converted this region into an easy-to-reach vacation destination for all sorts of Nationalities! A major destination for adventure-loving travelers is the Rincon de la Vieja National Park which surrounds the active Rincon de la Vieja volcanic cone. The 122,000-acre Santa Rosa National Park protects the largest area of dry forest in Central America, yet the park entrance is only a half hour drive from Liberia. The beaches in the Northern Pacific are equally gorgeous: the main destinations are the Gulf of Papagayo, Playa Hermosa, Coco, Ocotal, Playa Conchal, Tamarindo, Playa Grande and Playa Junquillal. Admired for its beaches, the central Pacific coastline extends from the Nicoya Peninsula and extends south to Quepos and the Manuel Antonio National Park. Travelers will find resorts with golf courses and Spa's to more typical, smaller seaside hotels and delightful ecolodges. When visiting the central Pacific coast, please consider these highlights: Nosara, Ostional Wildlife Refuge, Playa Samara, Playa Carillo, Punta Islita, Mal Pais and Santa Teresa, Montezuma, Playa Tambor, Jaco and Manuel Antonio. Bordering the Pacific Ocean to the west, and Panama to the east, this ruggedly beautiful southwestern corner of Costa Rica is the most remote region of the country, and features some of its most pristine rainforests and beaches. The three most appealing attractions are: Drake Bay, Osa Peninsula and Golfo Dulce. The best way to access these destinations is via a local flight from San Jose or Liberia: To Palmar Sur if you are headed to Drake Bay, Dominical or the Ballena Marine National Park or into Puerto Jimenez, which is well located for visiting the Osa Peninsula and the Golfo Dulce. The Caribbean coast can be divided in two parts, with the town of Limon a major gateway to both areas. The northern coast with its destinations of Tortuguero and Barra del Colorado offers some of the best wildlife viewing in Costa Rica, and boasts places for turtle watchers. The southern coast is noted for its prestine rainforests, although surfing, snorkeling and quality beach time are the main activities. This southern part is very Caribbean and the main attractions are Cahuita and Puerto Viejo.